One of the most famous Church Fathers for his godliness and piety, the greatest Apostolic fighter in support of the true faith, he attained the summit of religious and austere asceticism. Subsequent to the Council of Chalcedon in 451 AD, there remained no bishops in the Syriac Orthodox Church towards the middle of the sixth century AD, except for three. Our Holy Syriac Orthodox Church saw in the resolutions of the said Council a deviation from the doctrine it received from the righteous Apostles and holy Fathers, whereas the Byzantine state adopted its resolutions, and thus started persecuting those who rejected them. The Byzantine state killed some of the rejecters and exiled others. Others died as a result of the severity of persecution, and still others were dislodged. 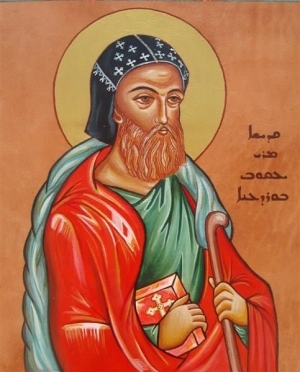 In this crucial period, God sent to the church a brave man, the monk Mor Ya`qub Burd`ono (St. Jacob Baradaeus), one of the greatest and foremost among the leaders of the Syriac Orthodox Church who protected the Syriac Orthodox Church against the attempts of its enemies to eradicate it. He encouraged its followers to preserve the jewel of the Orthodox faith that it received from the righteous Apostles and Fathers. He was born at Tall Mawzalt ܬܠ ܡܘܙܠܬ (now Verensehir, Turkey), the son of a priest named Theophilus bar Manu. While still young he became a monk at the Monastery of Fsilta ܦܣܝܠܬܐ in the neighborhood of his homeland. At this monastery he mastered the Syriac and Greek languages and penetrated deeply into religious books and theological science as well as asceticism. He was a great scholar, a successful preacher and a capable theologian, and was known by his piety and working miracles. His rough garments became like saddle-cloth, hence he was called Burd`ono. In 528, he journeyed to Constantinople, and was received with great honor by Empress Theodora, the daughter of a Syrian priest from Mabug (Manbej) and the wife of Emperor Justinian. Empress Theodora served the non-Chalcedonian bishops in distress. These were the Syrian and Coptic bishops, who were being persecuted and executed. At the request of the Arab king al-Harith ibnjabalah al-Ghassani andEmpress Theodora's efforts, he was ordained a universal bishop in 543/4 AD by Mor Theodosius, Patriarch of Alexandria who was exiled at the time in Constantinople. Three imprisoned bishops participated with Patriarch Athanasious in laying hand. Mor Jacob, the universal bishop, set out on his mission touring Syria, Egypt, Armenia, Cappadocia, Cilicia, Isauria, Pamphilia, Lycaonia, Lycia, Phrygia, Cana, Asia Minor and the islands of Cyprus, Rhodes, Chios and Mitylene, and also into Mesopotamia, and Persia. He visited and ministered to churches, instructing and encouraging the Orthodox believers. Authorized by the patriarch, he consecrated twenty-seven bishops and ordained a few thousand deacons and priests, not for getting to return quite a few times to his monastery. He continued this work for thirty-five years, indefatigably fighting the good fight for the Church of Cod, which he supported in the time of adversity until he died at the Monastery of Romanus or the Monastery of Cassian on July 29/30, 578 and was commemorated by the Church. St. Jacob drew up a liturgy in fifteen pages beginning with "0 Lord, the most holy Father of peace," and several letters, four of which were published in the Syriac Documents - three addressed to John of Ephesus and others, and a general letter to the bishops and priests which is mentioned in his lengthy biography.